Rising redshirt senior Kerry Blackshear has decided to enter his name in the 2019 NBA Draft, as well as the transfer portal. He could also remain at Virginia Tech for his final season of eligibility. 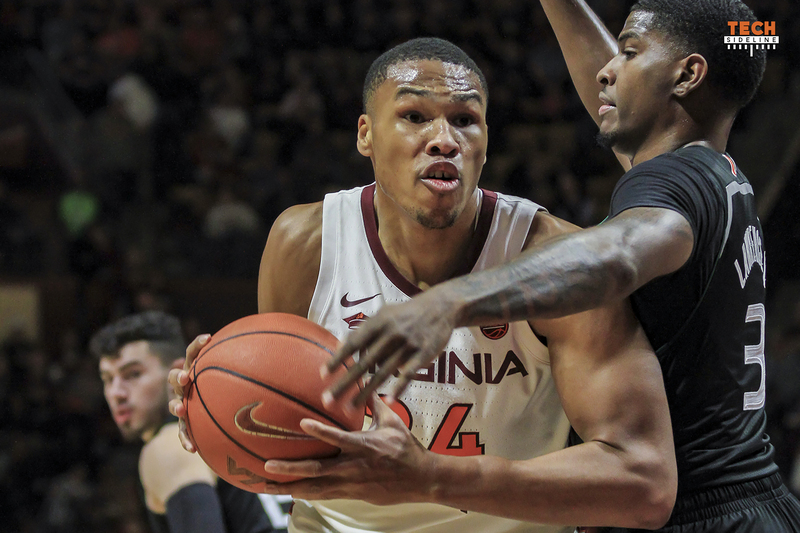 Blackshear averaged 14.9 points and 7.5 rebounds per game in 2018-19, and he was the team’s top scorer and rebounder during the time Justin Robinson missed with a foot injury. He has already graduated, and would be eligible to play immediately at another school. He is currently not projected to be drafted, and he could decide to withdraw from the draft if he chooses. Blackshear indicated in his message that he is still considering a return to Virginia Tech. New head coach Mike Young has met with his parents in Florida, and Blackshear’s father told Mark Berman of The Roanoke Times that Virginia Tech is still “at the top of his list.” Click here to read the whole article. It’s still possible that Blackshear, junior guard Wabissa Bede and redshirt freshman guard/forward Landers Nolley could still return to the team. It’s also possible that Emanuel Miller could request to be released from his letter-of-intent. He is a Canadian player, and he was recruited to Virginia Tech by former assistant coach and fellow Canadian Jamie McNeilly, who has since joined Buzz Williams at Texas A&M. Besides attempting to hold onto players in the transfer portal and trying to convince former 2019 signee Anthony Harris to renew his commitment, Mike Young is in the process of identifying and recruiting new 2019 prospects, and is likely evaluating numerous graduate transfers as well. 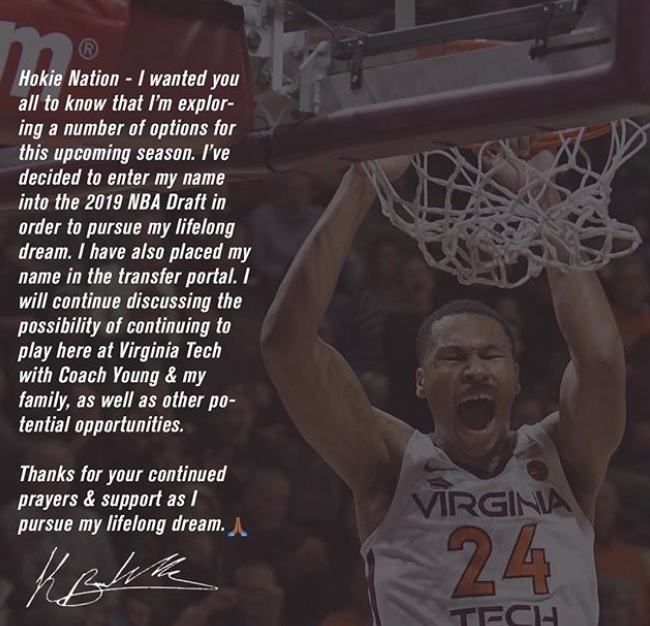 Virginia Tech’s final 2019-20 roster is not close to being set. Thanks for the years KBJ. Everyone left you, so do what makes you happy! I like your comment, the roster is not set. NCAA should investigate Buzzs assistants leaving to the place he just so happens to be going. Buzz was great for VT, but the way he left the program is just not right. Assistants going with a departing coach is the rule, not the exception. It’s not a violation in the slightest. If Buzz was guaranteeing you your same spot as you write your next chapter……..wouldn’t you roll the dice and follow him too? Everyone has to do what they think is best for their future, not ours. Hope he stays, but if he doesn’t, good luck. I assume Radford and Palmer are also returning? I don’t get the mentality of those thinking he should leave. Would you have wanted to move for your last year of school. Screw that! I had friends and enjoyed my time in Blacksburg & years later I still enjoy my connection to the school. I darn sure would not have wanted to go to school for one year somewhere else unless I needed to move to continue my education. Kerry has been a pleasure to root for so whatever he decides, I wish him well but I hope he enjoyed his time in Blacksburg enough that he sticks around. Personally, I like everything I’ve learned about Coach Young & think he’d be a great guy to learn from & play for. I think there is a very high chance that Coach Young will be here for many years to come. If that turns out to be the case and I was athlete, I’d have a lot of pride knowing I was in that coaches first class. I’ve argued that quite a few times, you’d have to up and re-settle somewhere, make new friends (dump your old ones?) go through the whole transfer credits stuff. just seems like a lot of work to get to the same place, plus the idea that maybe this wasn’t home after all, just another stop on the road, don’t you want a place to come back to? Guy graduated and his friends are the team who’s leaving too. I can’t find an issue with any of the choices he has and he’s smart to keep them all open. I’d guess he’ll play for money be it via the draft or overseas but if someone he trusts says he’ll get big money in 2020 if he plays a year of college ball somewhere else why not listen? The world of college sports has changed, and dramatically at that. There aren’t anymore Bruce Smiths – and Michael Vicks – who retain strong emotional attachments to the schools that gave them the opportunities they had. I can’t blame KB for leaving, if he does. Next year will be tough. It’s not accurate to conflate our experiences as “normal” students with those of football or MBB players. They live in a bubble while at VT, and are relatively insulated from many of the things that a regular student experiences. Their teammates are their family. Their schedules are intimidating. And they are always under the microscope. I bet few have any friends outside the team or the athletic department. In KBJ’s case, most of his friends are already gone. Why stay? Would live for KJ to stay, but from a career dev standpoint it seems his best option is a 1 year stint somewhere where they are great with bigs. Well, that wouldn’t be at A&M. KBJ has all the options open to him. He should be an agent. Very smart move, IMO, and I wish KJ well. He has nothing to gain for playing with our Hokies next season. Take the transfer or go pro is the best he can do. Coach Young and our Hokies will have an awful season, unless CMY can find and get some quality transfers that have immediate playing time. Don’t think transfer is better that staying at vt. I think it’s a smart move too. Sheesh. It’s like none of ya’ll have ever interviewed at other jobs while keeping a job, yet because it’s public, there’s outcry. Have to give KBJ credit for the way he’s handling this. Kumah could have learned a thing or two about class. I hope the coach can keep him around since he’s a great player. I appreciate his contributions to the program and wish him well even if he goes to UVA …. I just threw up in my mouth! Still think odds as good as not that he stays. Being very methodical about decision. KB is handling it in a classy way. You mean Miller, not Belmar I hope. As much as I want him to stay, it seems like a sensible move on his part. Best of luck KBJ!